It is obvious to most in the world that the U.S. and Israel are symbiotically linked to each other – each using the other for their own purposes, some of which are common, others that are not. In Obstacle to Peace Jeremy Hammond dissects current events and the relationships between the two countries demonstrating that the biggest obstacle to peace in Israel-Palestine is the U.S. The focus is narrowed down to the specific relationship between the U.S. and Israel and does not delve into U.S. ambitions for the greater Middle East (which would still centre, if not focus, on Israel). It is also much less a history than it is an examination of the methods by which the U.S. plays its role. In his preface, Hammond says, “I have tried to write the book so as not to require an extensive prior knowledge of the subject to be able to understand it…to be accessible to a broader audience…willing to commit the time to developing a well informed opinion.” As a well informed reader I cannot say whether it would well and truly do this, but the language used and the actual structure of the book would make it accessible to a broad audience. It is a detailed work concentrating on the combination of actions and language concerning the U.S.’ supporting role for Israel. The physical actions, the identifiable events of history, could be presented in a much shorter work for the time span covered. It is in the realm of language – agreements (written or otherwise), media representations, speeches, discourses, and the many elements of international law – affecting, describing, attributing, manipulating – where the bulk of Hammond’s presentation concentrates. The latter element, international law, assumes a position front and centre in Hammond’s arguments. Both the U.S. and Israel rationalize their actions by referring to international law but they do so essentially by attempting to “manage perceptions”, create their own “narrative”, utilize the Chomsky described vehicle of “manufactured consent” all the while operating with a set of “double standards”. Hammond makes an intense and well structured ‘deconstruction’ of the misleading language, the obfuscation, the fog of jargon utilized by U.S. and Israeli politicians, pundits and media of all kinds. Without getting into the details of his arguments (I leave that for the reader to read about), several things stand out. One of the standouts is the U.S. media complicity/subordination, while ironically Ha’aretz of Israel frequently is much more critical – and accurately so – than the U.S. mainstream media. Another feature that works slowly into light is the quisling nature of Abbas’ ruling power. Essentially he is helping Israel control the Palestinian people. This is recognized by both Israel and the U.S. (and by Abbas) as the threat to cut funding to the PA is viewed as more political fodder for the public but if carried through would be detrimental to Israel’s occupation of Palestinian land. From the latter rises the idea that war is the answer, that peace is not in the interests of either the U.S. or Israel for geopolitical and economic and other domestic reasons. The largest element however is language – the language used for customary and coded international law. Obviously there are different interpretations of both the customary and treaty laws, but there is sort of a law of laws, the Vienna Convention on the Law of Treaties, that says, “A treaty shall be interpreted in good faith in accordance with the ordinary meaning to be given to the terms of the treaty in their context…” Thus, if the ordinary meaning is to be understood in context, then to support a position that would under the ‘ordinary meaning’ be against international law, it becomes necessary to change the context. However the reality of the context can only be changed by managing its presentation. Changing the context is done through the methods described by Hammond throughout his presentation: alter the narrative, use double standards, manage perception, manufacture consent. It is in this area where Hammond does a superb thorough deconstruction of Israeli/U.S. attempts to change the context to fit their own denial of international law as it pertains to them. As an example, this is shown by their attempts to stop Abbas from seeking statehood recognition within the UN. That accession would change the manner in which the various parties interact, and change the global view of how to deal with the situation in Israel/Palestine. It also reaches farther, as exemplified by the great fear of Palestinian accession to the International Criminal Court (ICC), which asks the question, if what you (Israel-U.S.) are doing is so in compliance with international law, why is there this fear of Palestine having recourse to the ICC? 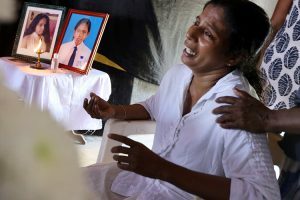 One of my favorite neocons, John Bolton, “mindful of its [U.S.] complicity and the possibility of future prosecution for war crimes at the ICC….warned “to convoke the International Criminal Court is like putting a loaded pistol to Israel’s head – or, in the future, to America’s.” (p. 407) Why, Mr. Bolton, why? The UNESCO and ICC cases, presented towards the end of the book, highlight Hammond’s use of the four aspects of contextual methodology of the U.S.-Israeli dialogue concerning Palestine. A clear double standard and change of narrative exists concerning the determination of a state of Palestine as per entrance to UNESCO. Then Secretary of State Clinton cautioned against recognizing a state without “determining what the state will look like, what its borders are, how it will deal with myriad issues that states must address” – none of which issues had prevented the U.S. sixty-three years earlier from recognizing the state of Israel only minutes [italics in original] after the Zionist leadership unilaterally declared its existence without borders and mostly on land they had no rights to.” (p. 369) In fact they had no rights to any of the land other than the 5.8 per cent they actually owned as the UN Partition Plan was rejected by the Palestinians and had no power of international law. 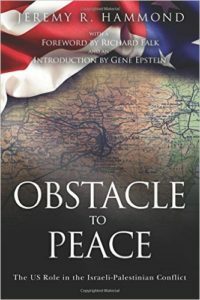 Obstacle to Peace is a lengthy and involved read, yet readily accessible. It can and should serve as a reference work, a compendium of information on the Israel-Palestine conflict. As for the initial structural reference, the chapters are clearly delineated and set out with clear subheadings. The bibliography/reference section is extensive. It also struck me that the words narrative, double standards, manufactured consent, manage perceptions are not listed in the very useful index – these contextual methodologies are so widespread throughout the book the marker would simply be passim. Obstacle to Peace – The US Role in the Israeli-Palestinian Conflict. Jeremy R. Hammond. Worldview Publications, Cross Village, Michigan. 2016. Michael Byers, War Law – Understanding International Law and Armed Conflict. Douglas & McIntyre, Vancouver, 2005. P. 3-4. Some actions that may have become customary, such as pre-emptive war and the ‘right to protect’ syndrome have been abused by the U.S./NATO (Iraq, Libya, Syria, Kosovo/Serbia, Afghanistan) and now are not considered to be a customary rule (i.e. not accepted by the majority of the world) basically as they were used as an excuse to invade and change governments in other countries who did not accept U.S. global hegemony.